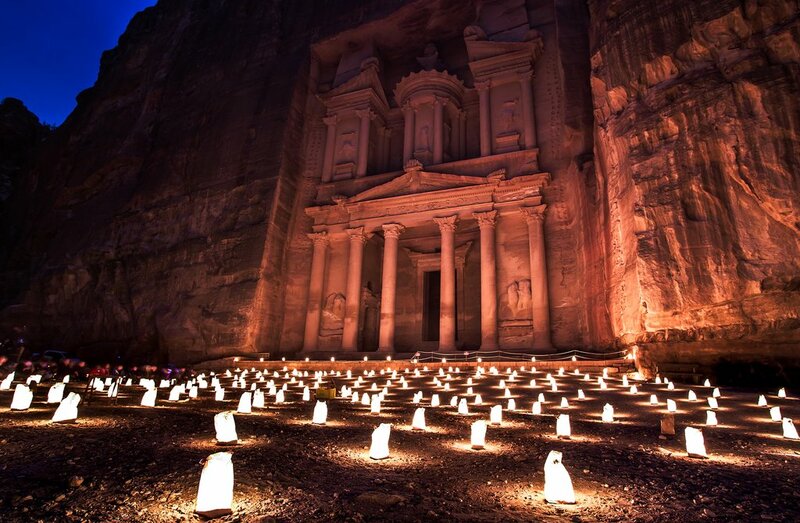 When people dream about visiting Jordan, the lost city of Petra is what they usually envision first. Designated as one of the Seven Wonders of the Modern World, this meticulously preserved remnant of ancient civilization is a breathtaking expanse of towering rock walls and intricate architecture. If your time is limited, it's easy to get lost in the endless sightseeing and lodging options. Our experts shared their best advice for travelers headed to Petra - read on to learn how to get the most out of your visit. What you see in Petra depends on how much time you have (if you need help deciding, read more about how many days to spend in Jodan). 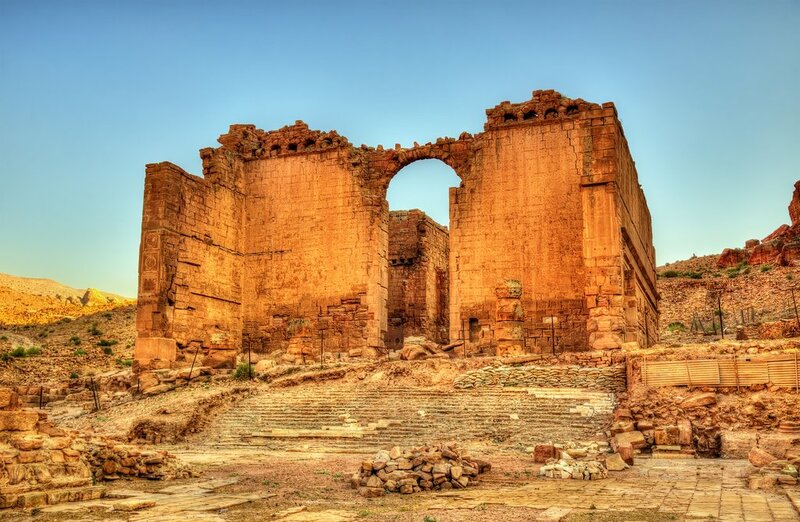 Most travelers opt for 1-3 days of wandering the grounds, taking in the labyrinth of structures and aqueducts cut directly into the distinctive red sandstone of the beautiful "Rose City." If you only have one day in Petra, focus on the highlights. Start by taking your time through the Siq, eventually coming to the famously intricate facade of the Treasury building. Head to the impressive Amphitheater before continuing to the Colonnaded Street and the Qasr al-Bint temple. Take a lunch break to fuel up before an afternoon climb to the Monastery, admiring the view of the Royal Tombs on the way back down. Following this route allows for a full and well-rounded day of activity. Two days will allow for a more leisurely pace and further exploration tailored to your interests. If you're a history buff, take a stroll down the Street of Facades, a row of forty houses and easily accessible tombs with ornately carved exteriors, or spend extra time learning about the civilization's remarkable water conduit system. For those more interested in trekking, take the steep trail to the High Place of Sacrifice for breathtaking views over Petra, or walk up the recently restored stairs leading to the top of Al Kubtha, making stops on your way up to enjoy dramatic views of the Treasury you visited the day before. With three or more days at your disposal, you can truly get off the beaten path. You might want to head to Little Petra, another archeological park nine kilometers to the north. Though significantly smaller in size, it's filled with beautiful ruins. If you make it to Little Petra, make sure you see the fresco on the ceiling of the Painted Triclinium. You can hike back into Petra where you'll enter through its "back entrance," offering an alternate, stunning view of the Monastery. You might also consider a guided trek up Mount Aaron: the holiest site in Petra for Muslims, Jews, and Christians alike. Taking at least half a day of strenuous hiking it's no small undertaking, but you'll be rewarded with beautiful views and a chance to take part in the cultural ritual of pilgrimage to a mountaintop monastery. If you decide to go, bring plenty of snacks and water, wear modest clothing (as we recommend in all of Jordan), and be prepared to make a small cash donation at the shrine. Navigating Petra's ancient walkways and structures is doable on your own. You receive a map with your ticket, and there are plenty of signs in the park to help you get around. However, many travelers desire more in-depth information about Petra's history and hire a guide to get more out of their visit to Petra. By sticking with one reputable guide throughout your journey through Jordan, you'll be able to tailor your trip to your own priorities and preferences and possibly adjust your schedule within the constraints of the arrangements that were made ahead of time. Travelers usually bond with their guide as they travel the country together, and learn details about life in Jordan during conversations over dinner and while traveling from place to place. Alternatively, you can find local guides available for hire at the visitors center. This will typically allow you to get more local insights specific to Petra, and access to more off-the-beaten-path gems. 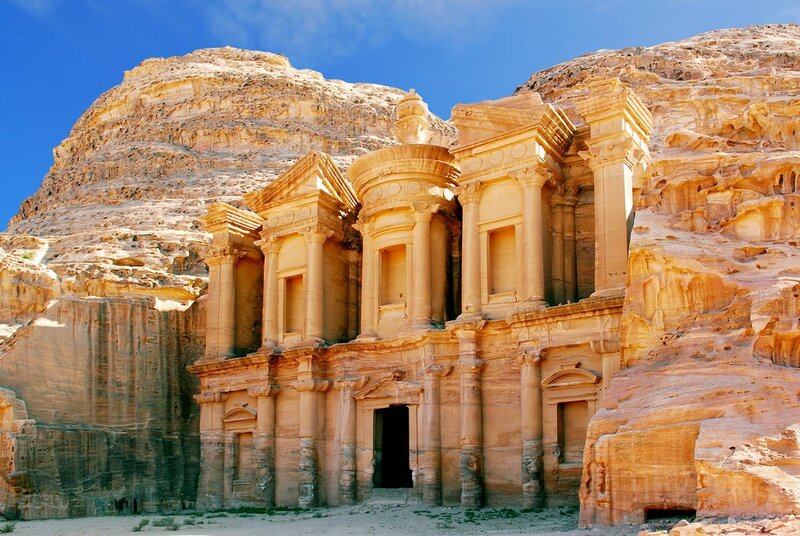 Here's an example of a fun, guided 4-day itinerary through Petra and Wadi Rum. 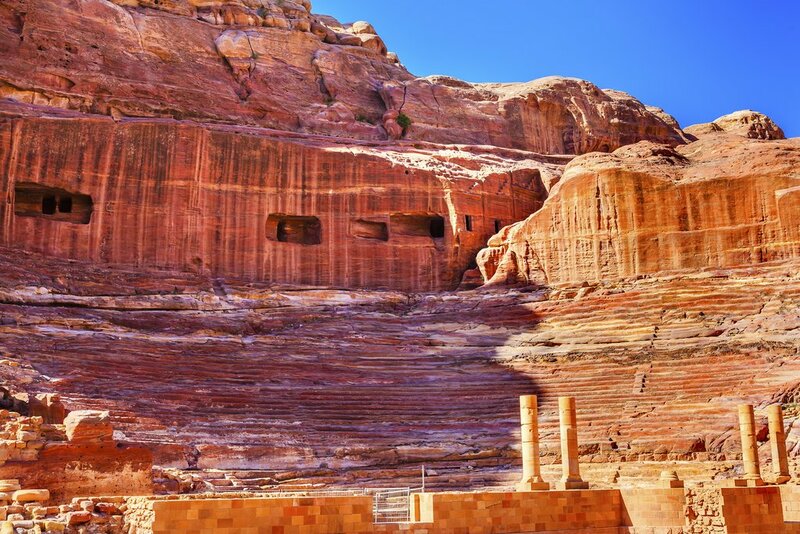 Having a list of important places to see in Petra will be helpful as you and structure your itinerary and prioritize what to do and see - here are a few to get you started. Siq: The Siq, a dramatic passage between two towering rock walls, is the most common way to enter Petra. It's easy to walk. Treasury: At the end of the Siq, you'll be welcomed to Petra by The Treasury, a towering and impeccably preserved example of Nabatean rock-cut architecture. Theater: This huge, Hellenic style amphitheater near the Street of Facades has a capacity for 8,500 people and was built before the Roman occupation in the first century AD. Colonnaded Street: Petra's main drag. Qasr al-Bint: One of the only free-standing buildings in Petra, this imposing temple was once the primary Nabatean place of worship. Royal Tombs: A collection of particularly large and ornate tombs, thought to be reserved for monarchs and high-level aristocracy. Street of Facades: This row of more than forty tombs and other structures lining the cliff walls of the Outer Siq is noteworthy because a few of the tombs are easily accessible. Monastery: A hilltop temple, the largest structure in Petra. Requires a strenuous trek up 800 stairs, with plenty of tranquil spots along the way to rest and admire the views. High Place of Sacrifice: Ceremonial platform, temple, and sacred obelisks atop a mountain. To get there, climb several hundred stair steps near the back of the amphitheater. Taking a tour of the grounds after dark lets you experience Petra in a special atmosphere. You'll have the chance to see the dramatic walls of the Siq by candlelight before finding a seat in front of the majestic Treasury building for tea and traditional Bedouin music under the stars. Petra by Night is available on Mondays, Wednesdays, and Thursdays at 8:30 PM. You can purchase tickets at the visitors center ($24 USD). Petra is accessible at any time of year, though the spring (March-May) and fall (September-November) are the most temperate for full days of exploration. Wandering the ruins in summer and winter can be less comfortable weather-wise, as you'll be more likely to encounter extreme heat or unpredictable rain showers. If you're willing to brave the elements, however, you'll be rewarded with significantly smaller crowds - having such a popular tourist attraction to yourself is something special and worth considering. No matter when you go, plan accordingly: beat the heat in summer months by touring Petra in the early morning or late afternoon, and make sure to bring rain gear and extra layers if you head there in the winter. 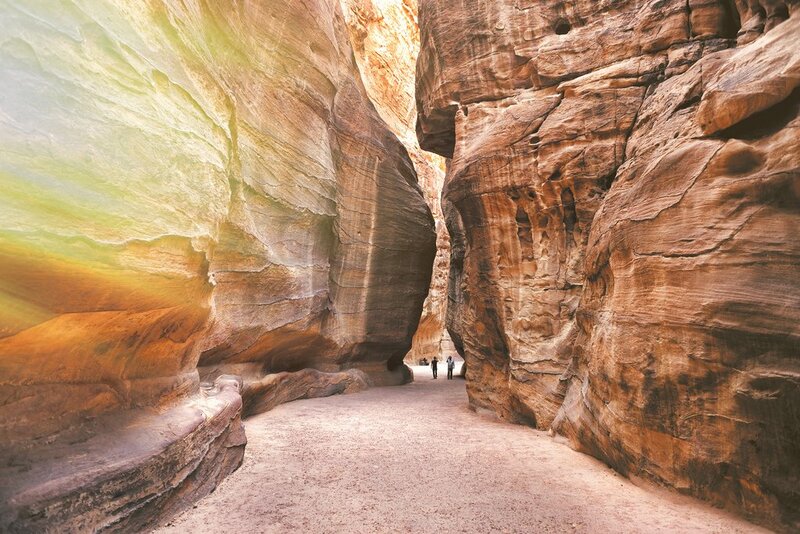 Fitting Petra into your Jordan travel itinerary is easy. The country is small, densely packed with things to do and see, and dissected by highways with lots of signage in English. You'll probably fly into Amman, making the capital city a great place to start. Take a couple of days to see Amman and Northern Jordan before heading south to Petra. There are endless places to stop and explore along the route, including the town of Madaba, where you'll find the oldest mosaic map of the Holy Land. Other highlights include Mount Nebo, the baptismal site at Bethany, and Kerak Castle. From Petra, you'll want to save a day or two to visit Wadi Rum, the protected swath of desert wilderness known for its fantastical rock formations and endless, sweeping dunes (learn more by reading the Ultimate Guide to Wadi Rum). After a few high-impact days of adventure, you'll be ready to chill out in the resort town of Aqaba or head straight to the Dead Sea for a float in the salty water and some high-end spa treatments. More interested in trekking than sitting in a car? A fantastic alternative route that allows for an even broader exploration of Jordan is the classic nine-day journey from Dana to Petra. After being transported from Amman to Dana, you'll head out on foot, exploring all four biospheres in the Wadi Dana nature preserve, sleep under the stars, interact with local communities, and approach Petra from an angle that many tourists never see. If you have limited time, going straight to Petra from major cities in Jordan is fairly straightforward. 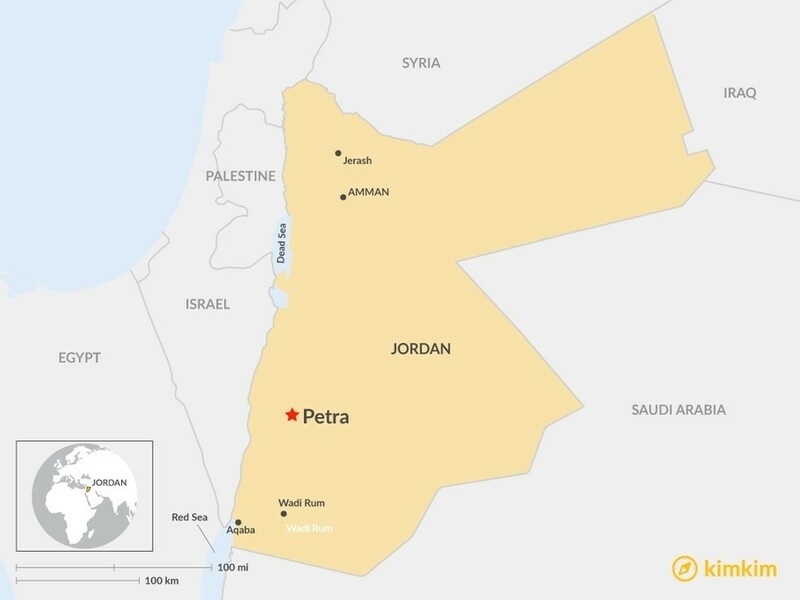 For travelers flying into Queen Alia International Airport, located 30 minutes from Amman, you can reach Petra in approximately three hours by car. If you opt for public transport, you can catch a JETT bus straight to Petra at the 7th Circle JETT bus station ($28 USD round trip). Only one bus a day currently runs on this route, departing at 6.30am. Keep in mind, you'll also need to budget for a taxi from the airport. If your flight is arriving into Aqaba, the commute to Petra will be quite a bit shorter - a mere hour and a half bus trip ($28 round trip). The nearest town to Petra is Wadi Musa, a village that has become a thriving hub for Petra-related tourism. You'll buy tickets ($70 USD for a single day; $77 for a two-day pass) at the visitor center which is located at the Petra entrance. 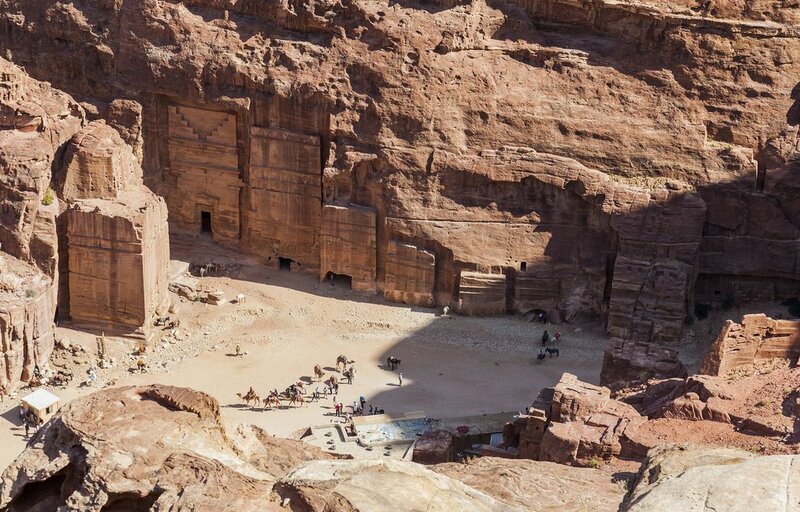 Petra is a very popular destination for travelers, with thousands of visitors daily in the busy season, and this is happily reflected in the wide array of available lodging options in the gateway village of Wadi Musa. For travelers in search of luxury, Movenpick Hotel sits just outside the park and offers five-star rooms and beautiful Arabesque architecture. Sip cocktails with a stunning view at the rooftop garden, or hang out by the pool. Other hotels that travelers tend to love are the recently opened P Quattro Hotel in downtown Wadi Musa and the Petra Moon Hotel, close to the Petra entrance. Want a room even closer to the action? The Petra Guest House is conveniently located inside the park itself. Boasting large, comfortable rooms and unique attractions like the famous Cave Bar, this four-star hotel is a popular choice. If you prefer a more adventurous experience, you might consider spending the night at the nearby Seven Wonders Bedouin Camp. Located about ten kilometers away in a settlement known as Little Petra, the camp allows you to take advantage of amenities like beds, electricity and hot showers while enjoying a culturally immersive experience. For more ideas on where to stay near Petra, check out this roundup of lodging options. It may be a small town, but Wadi Musa has a surprising number of delicious offerings in fun and festive bars and eateries. Be sure to check menus for some of Jordan's signature dishes—here's a list of the best. Red Cave: Specializing in traditional Bedouin cuisine, Red Cave is located just outside of Petra's entrance, making it a convenient choice after a long day of touring. Casual but inviting, you'll find nicely executed standards like grilled meat and lots of hummus. Entrees start at $10 USD. Al Wadi Restaurant: This fun and atmospheric eatery in the center of town offers a mix of regional cuisine and solid international options. Sit on the sunny patio for a hearty lunch of chicken mansaf or lamb kebab, or mix it up with one of the highly recommended pasta dishes. Entrees start at $7. Cave Bar: The real draw at this aforementioned establishment is the setting - a two-millennia-old Nabatean tomb, converted into a lively hub for nightlife at the Petra Guest House. Drinks here are a must, but if you're hungry, they also offer a nice selection of pub fare like fish and chips, potato wedges, and barbecued meat skewers. Remember to keep in mind the hefty 26% tax on alcohol, which is not included in listed menu prices. Sanabel: In the mood for something sweet? Grab a piece of baklava or another traditional dessert at this adorable bakery. If you're not sure what you want, you can try before you buy - the owner is known for handing out samples of the fresh-baked goods. Visitors are allowed to bring food and water into Petra. Many hotels offer reasonably priced packed lunches, though you usually need to put a request in on the evening before. There is also a small grocery store in Wadi Musa, a fresh produce market at the bus station, and plenty of stalls near Petra's entrance where you can purchase snacks and beverages before heading in. It is highly recommended that you bring a large bottle of water with you as well, no matter what time of year you visit. There are also quite a few places in Petra to buy refreshments, though prices are significantly marked up. You can choose between traditional Bedouin tea stalls, modern snack shops, and even a full-fledged restaurant called The Basin, located at the end of the colonnaded street at the foot of the stairs towards the Monastery. 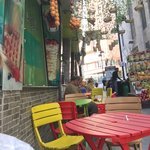 Its indoor area is air-conditioned and offers a lunch buffet with falafel, salads, the requisite kebab, and plenty of appetizing options for dessert ($24 USD at time of writing). Especially in the summer months, the desert heats up substantially during afternoon hours. Come early if possible - the park opens at 6:00 AM each day - and be sure to drink plenty of water. Getting to Petra early is also preferable because of the soft light, which highlights the natural colors of the stunning stone structures. Get there around sunrise or sunset for the most favorable photography conditions! Dress and prepare appropriately for a long day of walking outdoors. 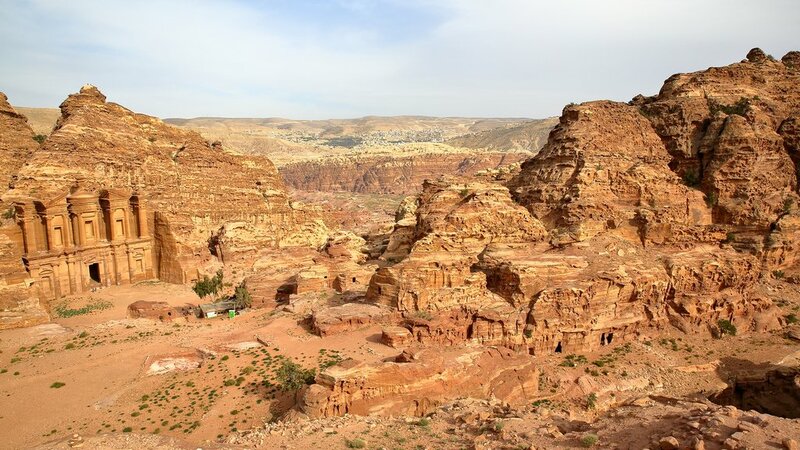 Petra is vast, so even if you opt out of any steep hiking, you'll still want to wear comfortable shoes with good grip, clothes you can move in, sunglasses, and a wide-brimmed hat. 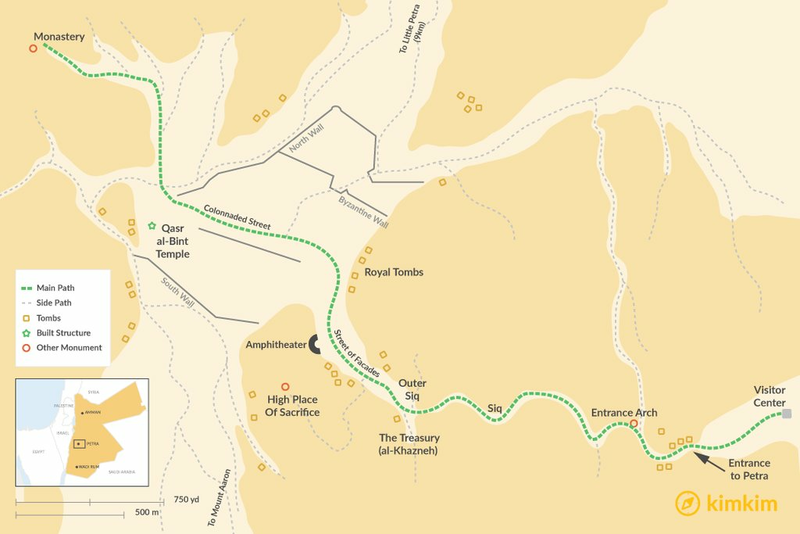 If a full day of walking seems daunting, note that there are donkey and camel handlers scattered around Petra that will be happy to let you take a ride. A horseback ride from the visitor’s center to the entrance of the Siq is actually included in the price of your ticket, but we recommend saving it for the way back at the end of the day when you'll be heading uphill. Take into account that a generous tip is expected. Be sure to carry plenty of cash. You'll need it for anything that you purchase at the visitor's center (including your tickets! ), tipping animal handlers and tour guides, and anything else you purchase while in Petra. Ask where to buy frankincense and other essential oils, it's one of the only souvenirs in the park worth buying (here are a few more ideas for worthwhile things to bring home from Jordan). Don't worry about seeing it all in one visit. 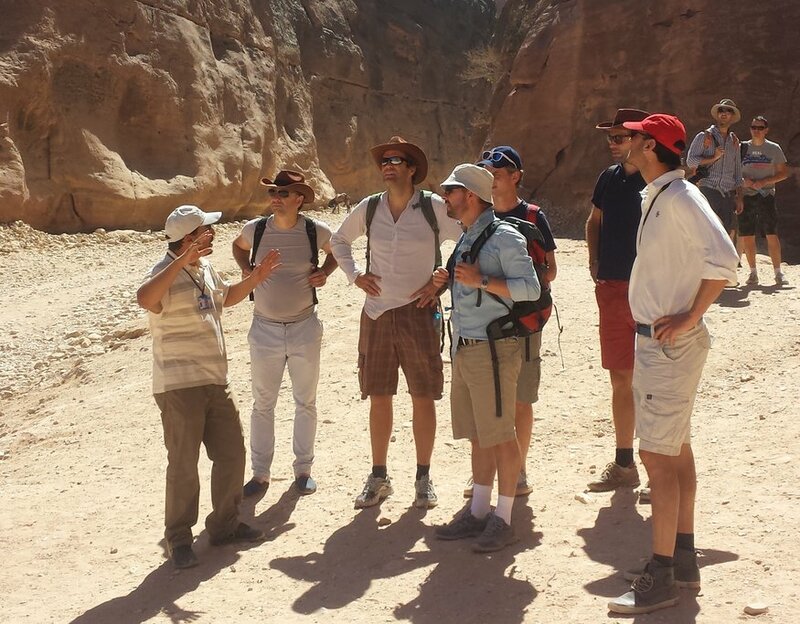 The archeological park is so expansive that many travelers return to Petra more than once to get the full experience. Try to resist the urge to rush, and have fun! Thanks to Matt and Tala from Experience Jordan, and Bianca from Wadi Rum Nomads for their help making this an insightful and comprehensive guide to Petra.